Storage sheds. We all know about them, we all need them. Most of mine have had a jumble of broken items, tools, spiders, toads, snakes and rust in them. Today, I found a shed clearly planned ahead and carefully. 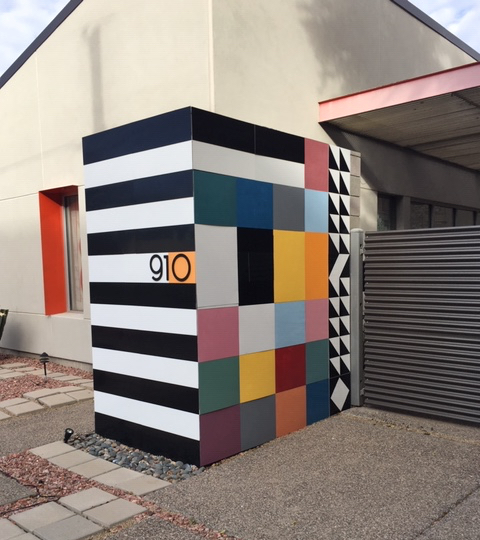 It’s in an older neighborhood in Phoenix, but as so often happens, once the updating started, almost everyone on the block got into the updating swing. I love this box because it is not what you would expect. It does not hide itself. It stands, colorful and proudly offering its services while also brightening a front yard. Being different isn’t easy, but it can be beautiful. –Quinn McDonald is a creativity coach who is working on a book about the Invisible, Visible World. The fence is different from all the other fences in the neighborhood. Instead of being made out of wood cut to the same width and height, it uses a variety of widths, a variety of lengths. The result is a far more interesting fence. 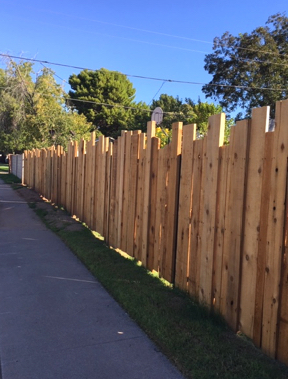 Instead of looking at the fence to see where there might be a mistake, where one slat is a tiny bit higher than the rest, I look at the fence as a whole, pleasing in its effect–a functional piece made from different sizes of lumber. And functionally, it would be harder to jump this fence than one that’s the same height. This fence. Just like real life. A lot of metaphor happening there. –Quinn McDonald is a writer who helps people ask for what they want. By 4:00 p.m. I was hungry. Dinner is later these days, we aren’t both home until about 7:00 p. m. But by later in the afternoon, even with a good lunch, I’m sure I will waste away without a snack. But it has to be healthy, too. 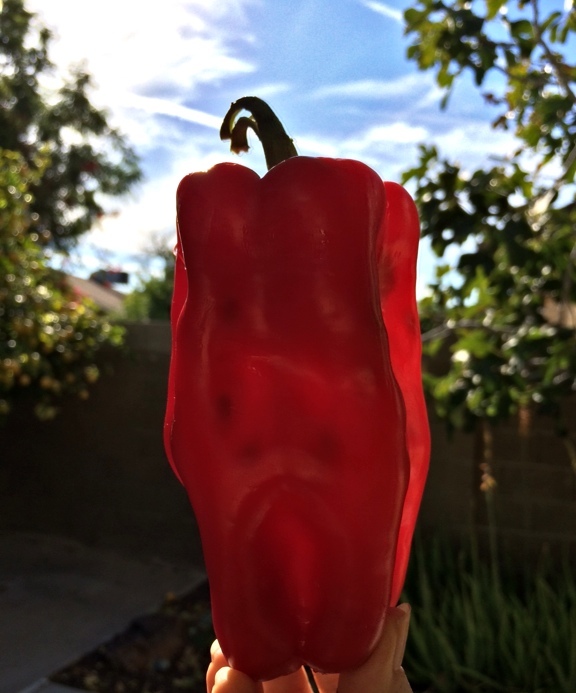 I headed for the fridge for my usual snack–a red pepper. Sometimes it gets a dab of peanut butter, sometimes a smear of soft cheese. Other times, just plain. A sweet red pepper is a perfect thing. As I reached into the crisper drawer, I noticed a wrinkled pepper, older, slowly exhaling its sweet aroma and crunchy texture in exchange for wrinkles shooting across its skin. Automatically, I reach for the sadder pepper. Training from long ago. In my family, we were not allowed to eat the fresh, new, crisp fruit. No, we were to eat the older, mushy fruit or vegetable first. That way, nothing went to waste. We did not waste in our house. I know, I know, but you didn’t know my parents and how close they had lived to starvation for years. Waste was not a choice, it was a way to stay alive. A habit once learned is hard to break. The result? We rarely ate tasty, just-picked fruits or vegetables. We constantly foraged for the spotted, the almost gross, and saved it from the trash by eating it, cooking it, or burying it in a casserole or soup. I hesitated, my hand over the older pepper. I knew it would not be crunchy, and the bright red taste had faded to a tougher skin and limp texture. And then it struck me: there are omelets, soups, garnishes, juices that could benefit from the older pepper. But the firm one, the one glowing in the corner, is meant to be eaten now. While it is fresh and juicy. While it is “now” perfect. That is when I will appreciate it most, honor it best. The older pepper can benefit from another technique, but this one? I’m celebrating it (and my taste buds) for its perfect combination of temperature, color, and happiness. Life. Enjoy it while it’s fresh. We can’t control much, but we can control the choices we do have. ––Quinn McDonald sees big lessons in small places. The Invisible, Visible World depends on perspective. Seeing things differently than others. Appreciating what shows up in front of you as you walk. I am two different people: one who wants to know how everything works, is interested in reasons and causes and one who wants to experience the world through my senses. 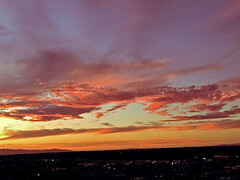 Sometimes I see something and just want to enjoy what I see, what it makes me think of, the memories it brings out. 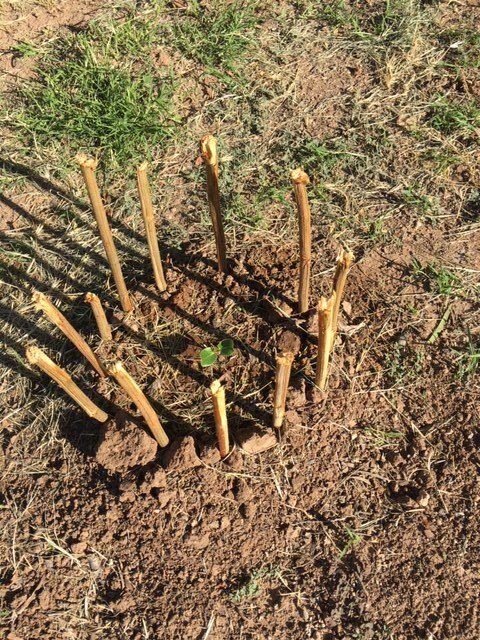 Here’s an example of how it works: I saw the tiny plant, clearly planted as a seed, surrounded by sticks, clearly broken off by hand, and stuck in the ground. A tiny, wireless fence. It looks as if a child did it, but there were five of them, all in a neat row. Too neat for a small child. How could that protect anything? The sticks were too tall for the birds to reach over, too close together for the bigger birds to squeeze through, and too tall for them to jump over. A week later, the plants were bigger, and still there. I noticed the shadows the sticks cast, and the health of the plant. I noticed that the soil was damp and smelled like rain. The things that protect us don’t have to be fancy, or complicated. Simple works. On plants. On people. –Quinn McDonald is a creativity coach who helps people discover their creativity and put it to use. While she helps people who are labeled “creative,” she works with parents, investment bankers, teachers, and marketing executives, who often don’t know how to find their creativity. Making your way as an artist has never been easy. For most artists, it can at least be interesting. During the Renaissance art patronage shifted from bishops and cardinals (that’s how all those lovely European cathedrals were built), to wealthy merchants and bankers with political interests, who supported artists and offered them a livelihood, but were often not the kindest, most ethical, or generous people. The Medicis supported Leonardo da Vinci, Boticcelli, and Michelangelo. Luckily, the Medicis had excellent taste and a gift for choosing the right artist for the job. It is not outrageous to say that the Medicis, by investing in art, laundered a lot of money by hiding it in art. The entire city of Florence (Italy), home to the Medicis, is alive with commissioned art. Now that there are fewer Medicis (and art patrons), artists have to look to the American business model for a patron and a path to fame. I began to pay attention to just how hard an artist has to work to become well-known. Roughly, here’s how it works: an artist develops a niche, a specialty, and focuses on that to attract an audience. The artist teaches this specialty, using favorite products. She (could be a he, too, but for this article, I’m using “she”) contacts a number of companies that produce the products she uses, hoping to get onto the company’s marketing or demo team. Once that happens, the artist gets free products, but has to promote those products on social media, podcasts, blogs, on-line and in-person classes, books, and videos. Traditional book publishers shucked their marketing departments, using artists to market for them instead. It was a gamble, and for some publishers, it worked. 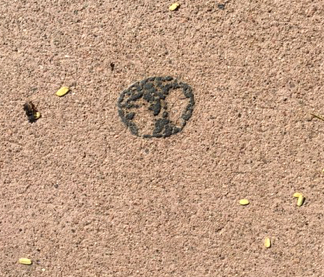 And effortless piece of art (butterfly, dog nose print, more) is no more than a piece of gum on a sidewalk. Now the celebrity artists are often bound to art- or craft-supply companies, required to promote the products. If an artist is especially lucky, they work with their supply company to develop a new color line, maybe even a new product, and travel to promote that company. For some, it’s a symbiosis that works. Artists develop classes to teach and books to write, and companies provide product and name recognition. Sometimes, the supply companies unwittingly train art bullies. What’s an art bully? Someone who insists on specific name brand products being purchased for class use. Someone who insists that when they praise a product, their followers must like it, too. And if a celebrity artist/art bully doesn’t like a product, well, their friends, audience, and class participants shouldn’t use it, either. It’s the “cool kids table,” all grown up, now with art products. Let’s get real: art skill never comes from buying a magic product. Art skill comes from experimenting, from failing, from trying more and different approaches until the practice begins to take hold. I thought of how asking questions to learn was so easily squashed by art bullying. Like the worst of grade schools, you have to color the sky blue (with a specific product) and stay in the lines. But I remained quiet. I did not clap back. Why? I don’t feel better when I make someone feel worse. Because I knew her fear of not supporting her money source, and I really can figure out how to use (or not use) washi tape. I made a mental note never to take a class from the art bully, though. There’s a price for bully-hood. Those who protect the product they are hired to market, who care about the source of money more than spreading creative ideas, may do well. But they can’t do good. I’m not at all sure that the art bully ensures the success of creative work. That work is always private, soulful, and revealing. And not stuck with a brand name. —Quinn McDonald’s blog has, in 18 years, never been monetized. I want to keep it that way, so I can like and dislike, recommend or share what works for me and what doesn’t, with freedom. Glue sticks are wonderful–for other people. For students, for fast workers, for people who hate using bottle glue. For me? Not so much. 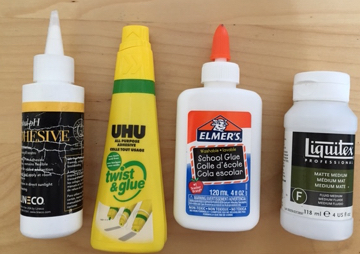 Well-working glues I use and like. Notice: no glue sticks. Left to right, Leneco adhesive, Uhu glue, Elmer’s, and Matte Medium by Liquitex. 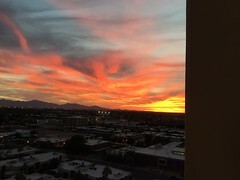 Part of the problem is Phoenix. Glue sticks dry out, crumble, and aren’t sticky in the low-humidity winter. 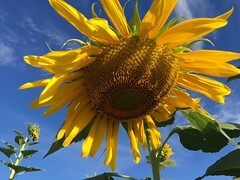 In the high-heat, high-humidity summer, they melt unless kept cool inside. I keep mine in the fridge, in a baggie, where they dry out in about a week. Someone whispered a new brand name to me. And as everyone who lives in eternal hope, I thought this would be “the one.” The brand is Coccoina, an italian company. They make pots of glue, tubes of glue, and glue sticks. I’m interested in the sticks. I ordered several. For me, potato starch means bugs. 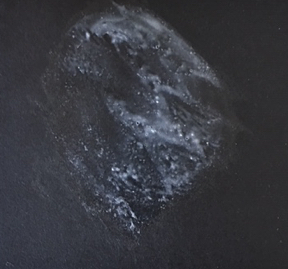 Maybe not in Phoenix, but when I lived in New England, most of the homemade wheat paste and potato paste I used wound up being eaten by tiny bugs, which left holes in my paper. Because I am an adult, have no children and home, and don’t expect people to eat my art, I am not so concerned about using glue that is edible. The Coccoina glue stick didn’t pass the basic tests. Here’s what it looks like freshly opened on a day that did not get above 72º, applied with a light touch. You can see it doesn’t apply evenly, it blobs. Yes, I could apply it with a brush. But that defeats the purpose of a glue stick. After spreading it around with my fingers, I left it to dry. After 24 hours of drying time (laughable in Phoenix, we have trouble keeping glue from drying out in seconds), it was dry, but lumpy. Slightly tacky. And it looked like this. It’s not matte, it’s not clear, and it’s not easy to control. My favorite glue stick is still UHU, which dries clear, but shiny, so I have to watch out where I put it. 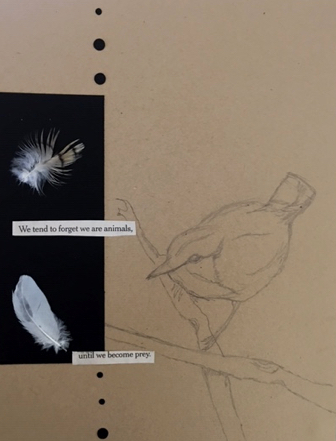 For regular collage projects, or for attaching feathers to paper, I’ll use matte medium. and a brush. Liquitex and Golden are favorite brand names. I’ve used it a long time and it dried matte, clear, and holds on to the collage pieces. If you have found glue sticks that don’t dry out, don’t glop, dry clear and matte, let me know. I always have more room in my studio for art supplies that work well. 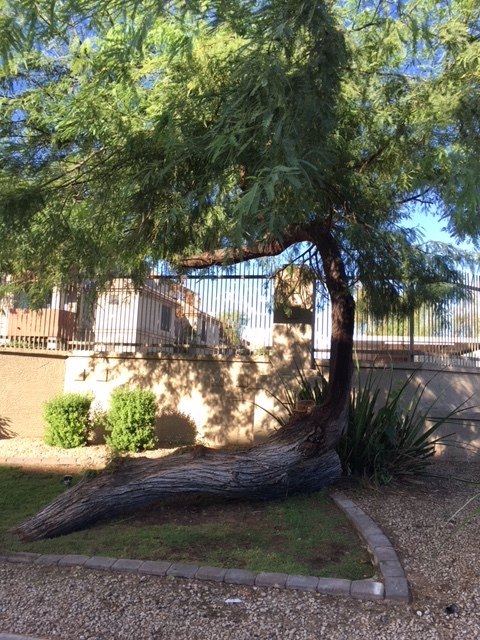 Trees have it tough in Arizona. The wind blows dust around them, wind gusts are high, the ground is hard, roots are fragile. Trees often topple in our monsoon season. Often, they are left to dry out before they are cut flat and removed. This tree was left to die, but still had a life to live. You can see the cut end in the right of the photo. But the tree had other ideas. It started growing again. Created a new tree right out of the old one, using what was available to create a whole new tree. It was a lesson for me: Yes, I have fragile parts, and yes, I’ve been felled before. But giving up is a choice, and it doesn’t have to be the only choice. It’s what I teach my coaching clients: you get to decide. You have a choice. Even when it doesn’t look like it, you have a choice. Build on the answer you want. –Quinn McDonald is a certified creativity coach and is working on a book: The Invisible, Visible World.